My mother’s standard party donation is a boule of pumpernickel bread with the center scooped out and filled with a spinach dip that includes water chestnuts because, of course. The sides are cut into fingers that remain attached at the base (as “severed fingers” would be unsettling, yes?) and can be torn off when the urge comes to swipe one through the center. The urge will come often, so I try to position myself in any room that the boule is not. Nevertheless, I hadn’t considered that there were other approaches to party bread until I came upon this 1998 recipe for one in Taste of Home, the belly full of dip forwent for a multi-pronged attacked of butter, cheese, scallions and poppy seeds, all toasted until melted and crisp. But why stop there? You could pretty confidently argue that you’ve happened upon a lucky series of life choices when you get to spend half an hour on a Wednesday morning at Whole Foods debating what you’d like to put on your party bread in addition to butter and cheese. There was so much to consider! I considered rarebit-ing it, with a boiled mess of butter, beer, mustard powder, paprika, cayenne, Worcestershire and a scattering of cheddar that I might dream about tonight. I wondered if we ought to go French, with gruyere, shallots and herbes de provence or style it like an American baked potato, with chives and bacon, sour cream and cheese. And then I realized that I’ve never once covered garlic bread on this site and was suddenly filled with purpose and couldn’t wait to get home and start playing in the kitchen. Yes, it’s true: garlic bread fills me with purpose. Garlic bread with herbs and cheese fills me with glee. So I came home and an hour later, this had happened and I was forced to experience the adversity of being alone in the apartment with it for hours until the remainder of my family would return at dinner time and we could pass it off as a side dish. It wasn’t easy; it smells unholy-level good. It maybe lost a couple “finger” croutons before game time (pull from the edges and it’s your little secret, I learned). But I imagine that were it appropriately situated, maybe alongside a giant pot of simmering red sauce-ed meatballs or grilled sausages, these butter-drenched garlic fingers with fresh rosemary, oregano, two types of sharp and one type of melty cheese burrowed deep inside a round of sourdough bread and taken from the oven right as some game (basketball, right?) is going on a few miles from here on a Sunday afternoon, well, I imagine it would make you some sort of hero. Other Superbowl Party Snack ideas: Meatball Subs with Caramelized Onions; Beef Chili + Cheddar Biscuits; Easiest Baked Mac-and-Cheese or Martha’s more indulgent one; Sweet and Smoky Oven Spare Ribs; Slow-and-Low Dry-Rub Oven Chicken; Baked Potato Soup; Roasted Tomato Soup with Broiled Cheddar; Minature Soft Pretzels; Bretzel Rolls (for sandwiches! ); Cheddar, Beer and Mustard Pull-Apart Bread; Chicken Empanadas with Chorizo and Olives; Ethereally Smooth Hummus; Mama Canales-Garcia’s Avocado-Shrimp Salsa, Potato Chip Cookies (or the Buttered Popcorn Cookies from the book) or Salted Caramel Brownies. This is definitely a flexible recipe; you can use any cheese and herbs you’d like, or seasonings. (I mentioned a few ideas that inspired me in the post.) I had intended to wind some thin strips of proscuitto around fingers, but then copped out at the last minute but my husband really thinks you should try it. Or, a scattering of bacon bits. I didn’t use all of the suggested cheese, because I was afraid it would be too much, which was obviously a silly idea. Use all the cheese, always, people. The one thing I’d be more careful with next time, however, is finding a sourdough that’s more sturdy. My soft, pretty fresh loaf had floppy fingers and I worried they’d stick together (only a little; can still be pulled apart while warm). A sturdier loaf would have more porcupine like fingers, all the better to pluck away while watching the game. Heat oven to 350°F. Being careful not to cut through the bottom crust (i.e., leave slices attached), cut bread loaf into 1-inch slices in one direction, then perpendicular, forming porcupine-like bread fingers. Transfer to baking sheet or roasting pan. 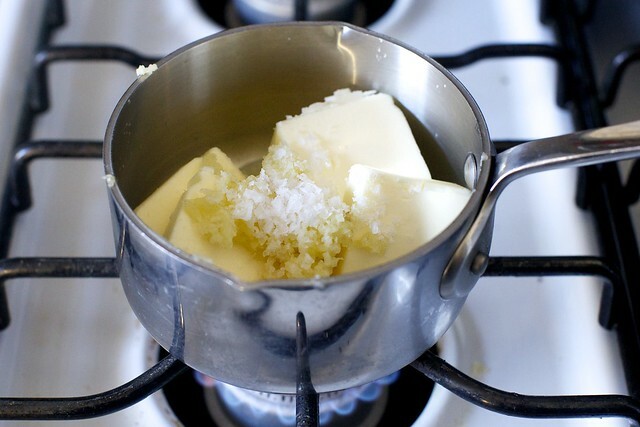 In a small saucepan or your microwave, combine butter, salt and garlic until butter is melted and sizzling. Pour over bread, making sure to separate any fingers leaning on each other to ensure the bread is evenly butter-soaked. Scatter with grated cheese, again making sure to get cheese all the way to the bottom crust too (helps finger separation, too) with a spoon. Sprinkle with first teaspoon of herbs. Cover dish with foil and bake loaf for 15 minutes, until warmed through. Remove foil and bake another 15 to 20 minutes, until edges of loaf are toasty and cheese has melted. Scatter with any additional green herbs for garnish and serve warm. This looks so festive! Love the social media appearances, at last. I can smell it in my mind. I die. I must have it. Oh no. No. There’s no way I can make this for just the two of us and baby, but I WANT IT. Someone’s getting a dinner invitation pretty soon. Do you think this would work using the infamous no-knead bread? Yes, this works with No Knead bread! I have done it successfully a few times. Do you think this is something that can be prepped ahead of time, then refrigerated? This looks awesome! Any chance you can you share the spinach dip with water chestnuts (yum!) recipe too? Yes, please! I made something similar last year that I found on Pinterest (http://www.beantownbaker.com/2012/01/cheesey-mushroom-pull-apart-bread.html) with mushrooms and green onions. But I like the simplicity of this one. Definitely going to add this to the Super Bowl menu! AAAAH how did you WAIT until your family came home to indulge? This garlic bread looks…A-MA-ZIIIIIIIIIIIIIIING! UGH — this looks amazing!! 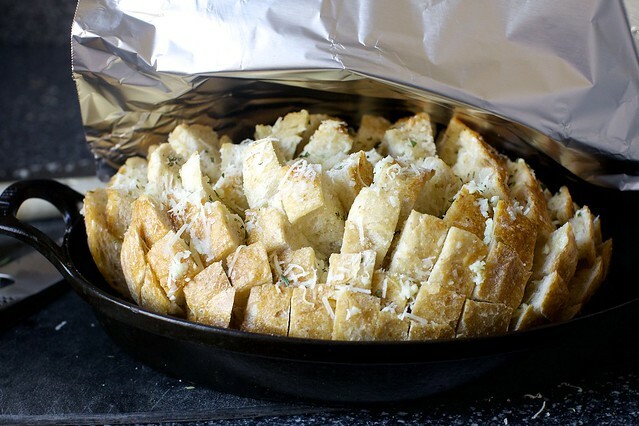 I absolutely LOVE garlic bread, and this just looks fantastic. I like the blooming onion look of it, easy to pull apart and snack on! I recently made some yummy snacks for this Sunday a few days ago (crab & artichoke wontons, spinach & artichoke tartelettes, and spicy chili & beef calzones) — but this will have to make a guest appearance I think. Thanks!! I was just thinking of making something like this for Sunday. But this garlic bread version is genius. My dad was ambiguous but now that I can say it’s a smitten recipe, he’ll have no qualms. He loves everything I’ve ever made using your recipes. Cheers! i don’t know you resisted this, i would have probably eaten this and slipped out to the store for another loaf of bread and made another before my family returned. ps i may try this with the no knead bread omg! I want to try it with brown butter! Thanks! Also, I’m saddened to think that our gussied up baked potatoes are an American thing, and that the rest of the world is missing out on tubers filled with broccoli and then bathed in cheddar cheese. Oh my gosh. I am currently in a garlic bread frenzy and using my DIY version of Johnny’s Garlic Seasoning on everything so I NEED to make this. Thank you! 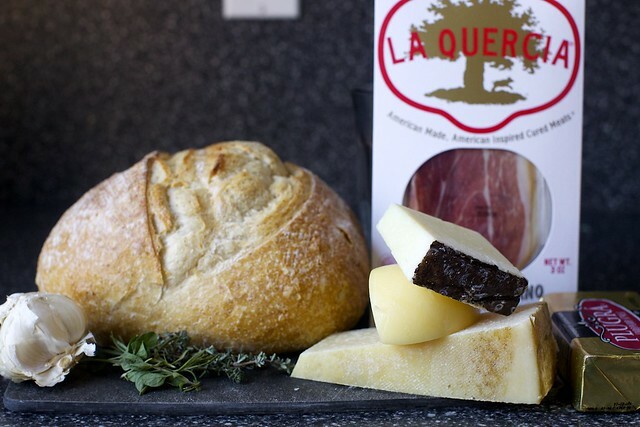 Any suggestions as to where to find a good loaf of sourdough bread (in NJ)? I have had a tough time finding good ones (any ones, for that matter) since I moved out here from the west coast. Deb – just browsed through my latest issues of Real Simple and Southern Living and guess what word they’re trending in those issues … smitten! Couldn’t help but think of you. Do you think caramelized onions would be out of place here? 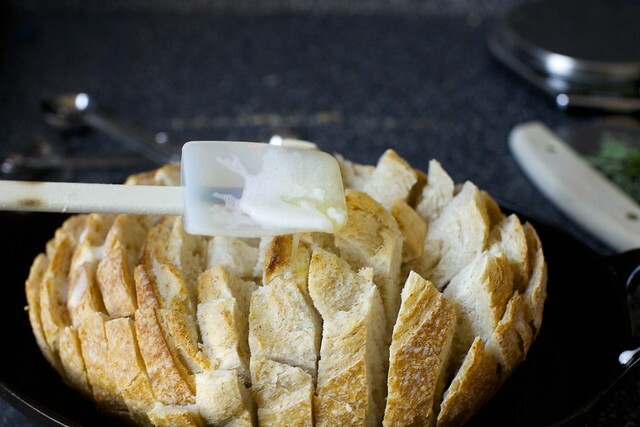 For serving — Btw, if you have ice tongs that look like this, they’re perfect for serving this (especially if you’re a germaphobe about people reaching into the loaf). I am not a germaphobe, but the little teeth at the end really helped pluck the finger from the bottom, so you didn’t miss the best stuff resting there. Once all the finger are plucked off (shudder, such an image! ), I suspect you could re-toast the base and cut IT into 1-inch fingers for continued snacking. Shayley — Caramelized onions would be out of place nowhere, in my opinion. Leslie — Funny! As in… using the word a lot or did they call it out as a trend word? Zoe — Yes, but only a sturdy bread will have porcupine-like fingers. Molly — Yes, that. So my longer-winded quibble with Pinterest was that although it is ostensibly intended as just a site for visual bookmarks it seemed to have become a place for pining (wish my home looked like that, wish I could afford those boots) which I find unhealthy and mostly try to stay away from; I also didn’t want any part in using the SK name/handle to suggest that anyone needs a set of $100 candlesticks that I found pretty, because that is sooooo not what this site is about to me. But, I finally realized that it doesn’t have to be. My approach in the past has always been to try to meet readers where they are — i.e. if you want to find out about new posts via email or Twitter or FB, I’ve got you covered. I’d just left off Pinterest (because I thought it was for other things) and Instagram (because I love it too much to clutter my feed with site shout-ous). Nevertheless, as with all social media, I do the bifurcated thing, there’s always a @debperelman or @thesmitten for my own personal pins/photos/ramblings and an @smittenkitchen for site-official stuff and anyone who wishes can follow site notifications there. Meanwhile, if there’s anything I’m missing (don’t say app, don’t say app, heh), let me know. It used to be that almost everyone came in via Google Reader (or, at least a quarter million people, in SK’s case); it’s not clear what is taking the place for people who stopped using Google Reader but maybe didn’t just pick up with a new RSS reader. What a treat! And yes, with Superbowl Sunday just a few days away, sounds perfect! Ooooh Deb, you’re killing me!!! THIS LOOKS SO GOOD!!! Insane craving for garlic bread right about now! Oh dear god, yum. Going to save this for a special time when I can’t be arsed to think about calories. OK here’s the plan. I make this, take extra insulin, and eat the entire loaf. Do you suppose a baster would help get the butter down to the bottom. And by the way, it sound like when all the fingers are gone you might have a piece of the crusty bottom left that you could then toast because everyone knows any bread is improved by toasting. This is the garlic bread hedgehog!!! This looks so incredible! And the Pinterest pages are gorgeous! Off to check it all out. Have a great one! Oh my gosh, I’m SO making this to bring to a Superbowl party this weekend — it’s perfect! This looks delicious! Will definitely be making this for my friends this Sunday. Hopefully if I make it right before I need to leave for the big Super Bowl fiesta I won’t have the time to eat half of it myself before I get there…! I love this! I can’t wait to try the recipe this weekend for a little (not “game day”) get-together! Deb/Molly – Yes to all of that. I also mostly hate pinterest for the reasons you’ve described, but could see myself checking over there for dinner ideas on nights when I’m struggling. Also, not sure about others, but I don’t use a feeder; I just check your site daily hoping for a new post, knowing there won’t be one everyday but also knowing i’ll stumble upon a recipe or comment that interests me. I can see how an App would be handy I suppose, but for now I’m perfectly content saving your recipes to Pepperplate and using that App to keep my buttery fingerprints restricted to my phone and not my laptop keyboard. side note Deb – you didn’t add the flat whisk to the “tools” page. i just got one for xmas and simply don’t know how i lived without it! Thank you for the Pinterest welcome! YES to all this!! And so excited about the new Pinterest page, too! I really appreciate your viewpoint on Pinterest. Im not about the comparisons either, but I do use Pinterest for organizing recipes I find online… mostly SK recipes, these days! So glad you decided to ‘be there’. Thanks for all you do. This is a perfect mash-up of posts for me, I saw a photo for a similar recipe on pinterest, but with no real instructions, so here it is! Pinterest + SK, I love it! I was a hold out for most social media too, but I love the random assortment of ideas on Pinterest, so glad I can check out SK there too now!! You are so fantastic to your readers Deb!! Aaaaah this timing is perfect. Thank you for this. And welcome to Pinterest. It’s a good place to be. Garlic bread looks delicious! But I was stopped in my tracks by rarebit. What is this delicious thing!??!?! Googling can tell me but pleeease pleeease, we need a recipe! Garlic bread is always a instant favorite! I will being putting my cobb loaf to good use tomorrow with this recipe. I could eat food like this every day. Also, YAY Pinterest!! Attach directly to my derriere! Wow, really? I’m trying so hard to be pious. sniff! With a too soft loaf would it help to pre-bake it after it is cut but before the butter, cheesy herby garlic stuff goes on? Then back in the oven to finish. Leslie — Maybe! Or, if the loaf is soft but not too tall, there won’t be much finger-flopping. I mean, it will not be wrecked if the fingers flop over (while warm, they’ll still come apart), but if you’re going to the store and have options, pick something firmer. Sarah — Yes! We like it. Dear SK you are going through an amazing purple patch at the moment – everything has been inspired, looks amazing and just has me itching to get cooking. I’m British so won’t be doing the Super Bowl thing but this would be great for rugby as well! Thank you – cannot wait to see what you come up with next! I switched to Feedly from Google Reader, I found it to be the most Google Reader-esque. I did not enjoy Blog Lovin’, mostly because I find the name obnoxious. Good to know in not the only Pinterest resister… I also joined just this month. And yay! Now I can follow you! Oh, how fun. This reminds me o f the blooming onion but much better. I’ve been working on a simple home made bread that may work well enough long as it firm enough. I think I can figure that part out. This is perfect. So perfect. If I weren’t planning on making brownies (and one of those people that hates changing my plans/ ingredients lists that I write out days ahead of time) then I would make this for Sunday. No matter. It will taste just as good without the superbowl. Perhaps even better, as I am not really a football fan. Hi Deb, do you have any recommendations for homemade party snacks that can be stored in the car for a few hours before being opened? We will be going to church in the morning and then running some errands before we go to our party. If not, I will just pick up something at a store before heading over. Thanks! Brittany — Maybe the Sugar and Spice Candied Nuts, Parmesan-Black Pepper Biscotti, Salted Brown Butter Crispy Treats or Cheese Straws. Oh man your bread looks marvelous!! So simple but such a hit at a party. I wish I could eat my computer screen. Bread, Cheese, Garlic- oh my! Well I don’t do the Superbowl thing either..but there is no reason that you could not make this for a Downton Abbey /Sherlock alternative evening.. and I look forward to making it this summer as part of an outdoor dinner/barbecue. Thank you Deb! This will be perfect for Sunday, or any other day for that matter. I must admit to having had a crazy craving for ye olde scooped out sourdough (in my family’s case) boule with spinach dip over the holiday season. It’s really never been my thing, but, for some reason, I couldn’t stop being thinking about it and feeling nostalgic. Now that you’ve brought it up, I might have to just make the darned thing! Hi Deb! I love garlic bread! I would definitely try this one. Thanks for the recipe! Hey deb, bread looks ahhhhmazing! Thx for all your inspiration and all the thoughtfulness you put in your recipes. Quick question, think I could build it, refridgerate and then take to a friends? Or just keep the butter mixture on the side and pour over later? Thanks!!! Deb–this looks delicious and I can literally smell the garlic and herbs waffling through the house come a Super Bowl Sunday. Thanks for the gret ideas! My mom also considered water chestnuts a de riguer addition to any “company” party dip- so fancy! +1…for your Mom’s Spinach/Water Chestnut riff?…Pretty please!! I would love to bring YOUR fabulous garlic/sourdough version ..plus a darker-hued bread..possibly with the spinach dip…to the Super Bowl festivities!! Your writing…as always…stimulates culinary curiosity and really wanting to “don” the kitchen apron. Thank you for continuous inspiration and passion. It looks fabulous and I can’t imagine anything more inviting than a large fresh warm-from-the-oven boule with all kinds of butter herbs and cheeeez melted into it. BUT, as Deb addressed above, germaphobe or no, it seems like the manhandling it might take to pull apart and extricate the deliciously buttery sticky cheesy fingers is partner to the infamous and undesirable Double Dipping of party food. The most delicious party dip you can imagine is easy for me to ignore (and that’s saying a lot) after the party-ers dive in ignoring the spoon. Which means that I will just have to make this recipe (as soon as possible) for a very select few…or maybe just one, quel tragic. Deb! love love your recipes and your cookbook. I have been pinterest-adverse because I see photos of things I want to make but then there are no recipes attached? It seems pointless but I guess I need to re-investigate because I must be missing something. I blog (or used to) for Edible South Shore and they were all excited when one of my recipes (chard tart with paleo style crust) was “pinned”. Still don’t really get it. I don’t even like football but if this was being served I would so sit in front of the tv and even cheer! Amazing. I have a bus load of my son’s friends arriving Sunday for the game. This will be phase one of a multi levelled approach to dealing with the teenage male appetite! Thanks for this great suggestion! Okay, this looks delicious! I have made a sweet version (that I found on Pinterest) with cinnamon and sugar and butter. If the savory version is anything like the sweet, this is a winner! Thanks for sharing. Dang it Deb! I have seen this recipe all over the web and in Taste of Home. I was able to resist! Now I don’t think I can. You make it look way more tasty than it is unhealthy. You are shredding my will power. This is peer pressure. :) Yummy peer pressure. Delicious. This recipe looks so amazing! I can’t wait to try it. Garlic+butter+cheese…heaven! I am always inspired by your recipes and truly appreciate what you do. I have a question. Can you please share tips on how to store these cheeses? 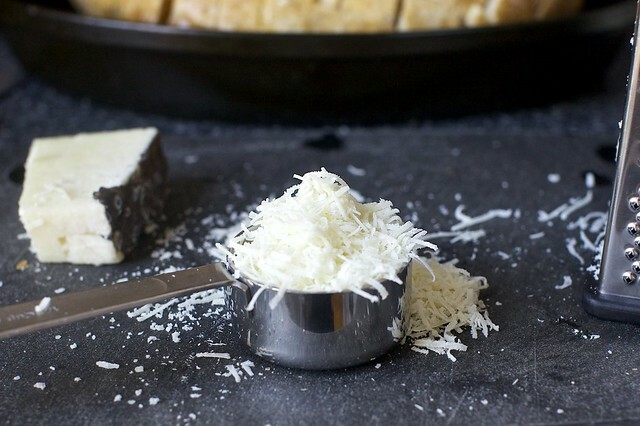 I always have leftover Parmesan and other pricey cheeses and want to store them properly for later use! I would really appreciate some tips. Thank you! Mirah K — I’m not a cheese expert, but I’ve been told by one that the best way to store cheese is in cheese paper, which is like a cross between waxed, parchment and plastic wrap (but paper) (here’s an example) and then, if you’d like to keep it for a while, you can slip it into a plastic bag. But if you can just keep it tight in the paper without it drying out, it’s best. Katherine — I don’t see Pinterest as a place to post recipe (or, it’s not for me) but to create visual (photo) bookmarks to ones (and other items). So, the SK Pinterest page has photos of all the recipes on the site, and you can click through to the ones that interest you. I guess sites get excited when recipes are Pinned because it means that people are bookmarking them/are excited to cook it. Yum! I’ve tried making a finger boule before and discovered that if you cut the bread 5-6 hours ahead of time, it dries out enough to take care of the floppy problem. Plus it soaks up the butter better. Love the ice tong tip. This is going on my Superbowl menu this Sunday! I will be dreaming about it until then! Yum, I’d like to enjoy this right now! You can’t go wrong with bread smothered in butter and cheese! Ok, I stopped at the store and bought the bread. I have plenty of butter, garlic from the garden and all the rest. My tongue was hanging out for this since I saw it at 6:30 this morning. I am going to try it with crumbled gorgonzola as the cheese. My mouth is watering at the thought! Once again, brilliant idea! Can’t wait to check out your Pinterest page (even though I’ve been pinning your recipes for what seems like years now). Yay for the ‘kitchen tools’ Pinterest! When you have time could you pin your dough cutter (?) 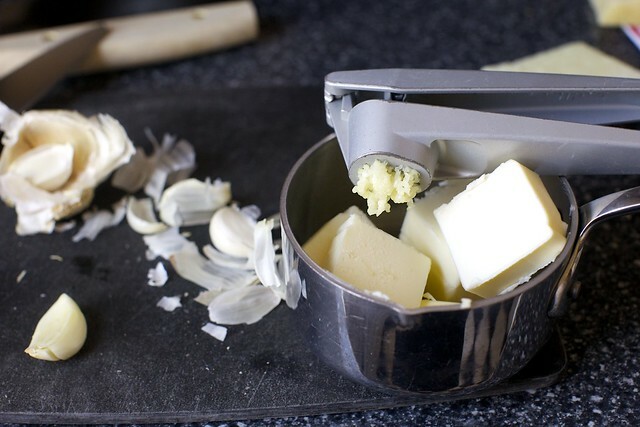 / tool that cuts the butter into the flour to make dough by hand? Thanks! Oh now Deb, COME ON with the rarebit tease and no recipe! Would it not qualify as the perfect post-resolution-relaxation period opportunity? I have a scribbled recipe that came from my mother’s recipe box that I haven’t ever made on my own and I figure you’re the perfect person to bring this to vintage indulgence back in vogue (please?). In the meantime, lovely post and thanks for getting us all drooling as always! Getting ready to head on over to Pinterest and look you up. So happy that you tagged along. For those of us who ever clipped recipes out of newspapers or saved stacks of old issues of Gourmet magazine, Pinterest is a haven. Rather than spawning a more deleterious form of covetousness, it has actually satisfied this deep place I have for the appreciation of beauty without the need to actually acquire anything. So I just pin away rather than pining away (could not resist that pun!) I also can’t wait to cut up my next sourdough bread and try your adaptation! I am already salivating at the thought! Blessings! Hi Deb: Good for you on trying “to meet readers where they are”. I’m not a Pinterest person (I use Feedly in replacement of Google Reader) but your brown sugar substitute and your buttermilk substitute have been my “go to” tips. I suppose you didn’t put them on Pinterest because you have no pictures on them? Also as a follower for many years, you need to officially put your “keep your oven top clean” in your tips section! Do I have to wait until the Superbowl? Officially on the Super Bowl menu as are you Salted Caramel Brownies. Thanks for all the awesomeness!! Smitten Kitchen on Pinterest?! Best day ever!!! Um…Deb…This looks like the FUNNEST THING EVER. making it for a potluck this evening… in the oven as we speak, not sure it’s going to make it to the party though… I pulled the fingers apart and sprinkle the cheese first, then drizzle in the butter… the cheese holds the fingers apart so you can get the butter down in there.. also I simmered the herbs, garlic and butter until brown then strained the herb and put the butter in one of those little squirt bottles… made it easier to drizzle the butter down in between the fingers… then just sprinkled the herb/garlic on top.. This is coming with me to the Super Bowl party tomorrow, so I won’t be tempted to eat it all by myself! Made this for a party this afternoon and it was great. Disappeared before my eyes! This is a game day favorite for us. You can mix it up a number of ways, but my kids really love garlic butter with diced pepperoni, parmesean & lots of gooey mozzarella. I’ve also done caramelized onions and prosciutto. You have to really overload it ’cause you want lots of melted yumminess on every bite of bread. What a cool idea! I love that it’s so easily customized – the flavor combinations seem endless! I’ll definitely have to keep this in mind for my next get-together. Garr! My husband just came back from the store with pre-sliced sourdough. I am going to see if I can MacGyver this, maybe by propping it all up with some foil or something. I’ll see you on the other side. The great thing about Pinterest is that it is what you want it to be. I’m an artist and use it to collect inspiration and tips/ideas/techniques. And recipes, of course. It only becomes a place for pining (which I agree, it can) if you want it to. Bread is prepped and ready to be popped into the over before game time! This just sounded too cheesy, herb-y, decadent to NOT incorporate into the Super Bowl spread! I also made marinara, in case anybody wants to dip their bread ;)Go Seahawks! This is in the oven right now. I found that stuffing a small hockey puck shaped tin foil wedge under the loaf helped with finger separation while adding the cheese and herbs. Also, I used a rectangular loaf (couldn’t find a boule) and put extra cloves of garlic between the fingers so that we’d have little dents of roast garlic at the end. I hope the cook time is long enough for them to soften and mellow. I will report back! This looks amazingly delicious! Will have to try it soon with my favourite white sourdough from Tartine organic bakery. I am also a recent joiner to the Pinterest party. I don’t know why I resisted so long either. Love it. Welcome to you and to me, I guess. Thanks for continuing to entertain, amuse and delight. This was the hit of the football party!! I had an italian loaf…was excellent but soft. Can’t wait to try again with a denser sourdough loaf. Such a great party food. Thanks SO much for the idea! This recipe has been a HUGE success. While the Broncos are suffering an embarrassing loss, my friends are happily munching away on this garlic bread. It is the tastiest plate of the spread (including the hot wings bought from the restaurant). Thank you so much for this recipe! This will be perfect for my tasty Dutch chocolate shake treat.Thank you for the share and the recipe… I’m so excited to have a try on it. Made this today for the Super Bowl. What a huge hit! Everyone loved it and want it as a new tradition. They were dreaming of all the soups and meals it would go great with! Thank you so much for this one. It was delectable deliciousness! Reporting back, as promised! The garlic did not have time to properly roast. The foil bread prop was a great idea, though. I made this for our SuperBowl party. It was a successful hit! Everyone loved it. The fontina, asiago and parmesan I used gave it a delightful bite. Good recommendations for cheese, Deb. And I must say, that if for any reason you have anything left (which we did because it was in the midst of a bunch of other scrumptious dishes of SuperBowl food), you should cube it up and put it in the oven at 400 for about 15-20 minutes to make some fantastic croutons for your upcoming salad or soup… or mid afternoon snack. Thanks for posting this one, Deb. I will be making this again for sure. Made this for the SuperBowl. 4 hungry 30-year-olds polished off a whole boule in under 20 minutes. It was the star of the day, especially since the game was such a flop. This is going to be a regular addition to party service. Thanks a million. I, too, made this for the Super Bowl, and it was also a hit (no surprise there, judging from the earlier comments). I bought my sourdough loaf that afternoon, and I pre-baked it just a bit to combat the softness, and it worked! I also tripled – no, maybe quadrupled – the herbs. The bread was just so lovely with all that green tucked inside and scattered atop it, I couldn’t help myself. Thank you, as always! I ALSO made this for the Superb Owl (new spelling I have taken to) and we loved it and all unbuttoned our pants after. I found that one of those flat wooden scrapers (as opposed to a wooden spoon) was great for this recipe for pushing the cheese and herbs into the crevices. Looks delicious! You blog is really inspiring and stylish! Think I could eat that whole load myself. And pinterest ain’t so bad :) Welcome to the club. So I made this the other night as a ‘starter’ and me and my companion managed to wipe out the entire loaf. I’ve been harping on about it to WHOEVER will listen. I’m doing it again on Friday, but wondered what you would serve with it to make a nice main? Beanie — If you eat meat, I honestly don’t think you can beat serving these with a big pot of meatballs (I like Ina Garten’s) in red sauce, no spaghetti. This is what we did last week. I used half ground beef and half ground chicken. I also made some broccoli slaw and this blood orange fennel salad and it was one of the best mid-winter meals, with every color in the rainbow on the table. It would also be good with this kale salad. Enjoy! SmittenKitchen on pinterest is awesome@@@!!! I really love love your clicks and keep drooling at the light angles, and specially at the sharpness of all your pics Deb. 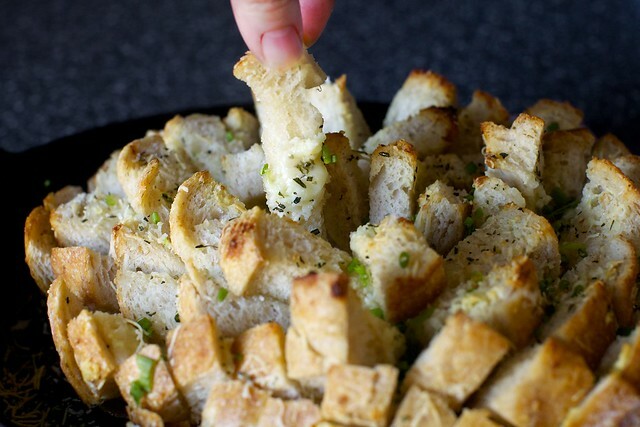 Garlicky party bread looks super easy and is an excellent idea fr a party snack! My friends and family are crazy about this bread. I have served it with various dips. It was one of the favs at SuperBowl and there were about 20 apps there that night. The infamous only-open-3-days-a-week pizza place that was meant to be my boyfriends birthday dinner (already invited a pretty big group, because what is easier to host than delicious pizza?) and two hours before they were supposed to arrive I found out they had randomly closed for the day (in classic Hawaiian style)! This party bread was a hit and last minute savior – I served it with your zucchini and almonds (a favorite of mine for ages), avocado kale salad, quinoa, and grilled chicken. To end the night we had your “Best Birthday Cake!” I laughed and thought I better thank you when I realized all but three of the items I served were from your blog. I’ve made dozens of your recipes- they have all been fantastic- but I’ve never commented. So thanks! I tweeted some cake pics at you- it turned out perfectly! I made this with some homemade bread. Even though I burned the bread a little bit, people were still RAVING about it. This is the impact that butter and cheese have. I am a huge fan of adjustable recipes such as this one. My grandma used to make us something like this when we were kids, and always tailored it to our wishes. This can also be fine-tuned for a side dish or the main meal, if bread is supposed to be served with it. I love all the recipes on this blog, every time I open it I just get this uplifting cooking spark and wish I could just drop whatever I’m doing and run to the market to get ingredients. One of the best parts of a spaghetti & meatballs feast in our house is the garlic bread. Much more heady anticipation goes with the bread than the noodles. So I love your genius idea of pairing sauce with this festive bread and leaving out the noodles. (One fewer starch!) But I’m trying to figure out how I’ll serve it. Would you divide the loaf into quarters, say, then plate them and pour sauce & balls over? Or have folks pull out bread fingers, then dish sauce onto their plates? Or something else? Chris — I was thinking that the meatballs could be in one pot/bowl simmering with sauce, ladled onto plates or bowls, and the garlic bread fingers could be pulled off/eaten alongside/dipped. Or, that’s how we did it. A salad or two on the side and we were in heaven. I’ve just had an idea regarding this recipe, which will be made as believe it or not, our entree tomorrow evening. Heck, I make cheese fondue on my rotation, so what could be bad? I’m going to combine every component for the filling, but put it into a pastry bag to pipe it into the openings. VERY psyched for this. A friend of mine has a Pi party every year on 3/14. All the guests bring different kinds of pie. Prizes are awarded for various categories. I think I’m going to try to win one this year by using this bread as the top of a meatloaf pie! 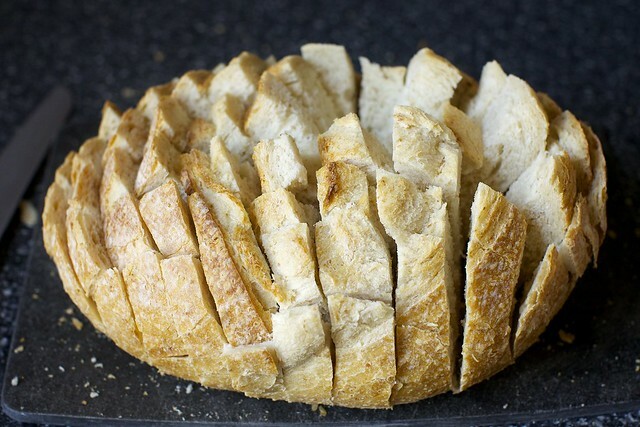 When you make the cuts in the bread loaf, do you angle the cuts following the curve of the loaf? I made this last night and it didn’t fall open in the flower shape like yours, it maintained its original shape and I had to lift it from the center of the bottom to open it for the butter/cheese/everything else, I was thinking maybe that was because I made my cuts straight up and down. Andrew — No, I cut straight down as if you were dropping a grid right over it. However, falling open might have more to do with the softness of the bread (mine was quite soft; I didn’t consider it falling this open a good thing because it encouraged the flopped over pieces to stick to each other) and the thickness of the loaf. Some openness is good, though. You can encourage it by placing something underneath the center of the loaf, maybe a heel of bread, to press the loaf convex. Honestly, I am making this now and I think two sticks of butter…I don’t feel that I have it soaked well enough. I’m on the last 15 minutes of baking uncovered. We will see. I will report back. Makes me so hungry…I have seen a similar recipe before where they called it Crack Bread. I served this with Deb’s naked pasta sauce and fusilli con buco. The guests were tickled over the “fingers” of bread, said it looked like a blooming onion. But…it gets better! The next day i used the leftover bread, cubed and toasted to make Giada D’s panzanella salad. It took it to a whole other level and was delicious. We just had this on new years eve with steak and your green bean salad. We couldn’t stop wondering what could taste better. GEIL. With kind regars from Germany. I have made this countless times and it is WONDERFUL! I use the asiago cheese bread from Fresh Market, just to add a little more cheese, since you can never have enough. Then, with the leftovers, i cut into cubes and use in a panzanella salad which adds oomph to that dish, too. Made this for a Super Bowl party and it went so fast that it was gone by the end of the first quarter. Deelish! Highlight of our Super Bowl party! We had a big 2 lb. loaf, which I cut earlier in the day to let it firm up. Thanks for the inspiration! I made this a few times during the Christmas / New Year festivities, and each time it has been brilliant. I’ve tried it with a bit of dijon which gives it another flavour, but it’s delicious as is. I’ve used round cobb loaves, vienna style loafs and even just a plain rectangle sandwich loaf, and all shapes work equally as well. I cook it on a piece of aluminium foil with the sides scrunched up so none of the liquid disappears – and put the whole thing on a tray in the bottom part of the oven to ensure no soggy bottom. The kids have started calling it Porcupine Party Bread! Hi Deb, it sounds like you didn’t serve this straight from the oven. Does it still taste good after sitting for a couple of hours? I rewarmed it with a little foil on top. It was more of a logistical thing, “working” on recipes in the afternoon that we often don’t eat until the evening. It rewarms great. I also rewarmed it the next night. If it’s not warm, it’s less luxurious, more crouton than rich garlic bread. I’ve made this and love it, and am revisiting the recipe for a holiday party this weekend. However, somehow previously I missed the amazing cast iron pan you made it in. So, now I need it :). I am thinking it is Lodge, but do you mind confirming? I found one that is about 12×7, seems right? Jennifer — It’s actually from Staub, I think the largest one here. (I found it on clearance a couple years ago for a fluke-ishly low price but this is a very good sale price right now for it.) Great investment, though. We use it all the time. Made 2 loaves of this tonight for a chili potluck, and it was a big hit! I used 2 round Italian loaves – no idea if they were the right size, but I used 1 recipe of toppings for each loaf, and they were amazing. I used rosemary and thyme. We’re home now, the leftovers are well cooled, and I can’t keep from pulling off the crispy bits at the edges. So. Yum!! I’m making this for a superbowl party, and I wanted to share this tip: I was working with exceptionally crusty, oblong bread, and I found that it’s a lot easier to snip the bread into fingers using kitchen shears (instead of trying to cut into a grid with a bread knife). Can’t wait to experience the final result! I made this for a Super Bowl party last night. It fit perfectly in my deep 9″ Emile Henry pie dish. My local grocery store had “Fontiago” cheese which I combined with grated Parmesan. Yum! Whoops sorry, I just realized my tip wasn’t very clear! You have to cut the bread one way using the bread knife, and then use the shears to snip the slices into fingers. The bread was amazing, and completely devoured by our guests, despite an extremely competitive array of snacks. Fabulous party bread. Whenever I take it anywhere people polish it off. Very versatile too, I can see it with all sorts of herbs and cheeses. This was awesome and super easy. Thanks for another great recipe. 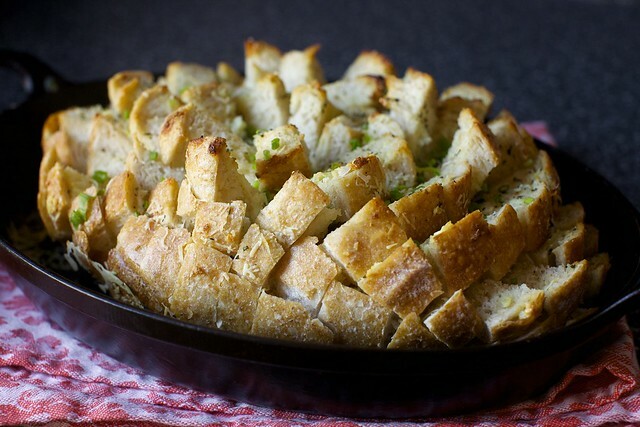 I’m coming late to the garlicky party bread with cheese party – but better late than never! Made this for NYE BBQ at home. Opening the door to guests with this in the oven was a triumph – the moment they caught a waft of the garlicky cheesy goodness their eyes widened and appetites kicked in. So delicious with a combo of pricey gruyere and cheapie pizza blend cheese (shame shame but I had it in the freezer and it needed using). Will have to restrain myself from making this too often. Thank you as always Deb and a very happy and healthy 2018 to you and your family. I don’t melt the butter; keep very soft & stir in garlic, spices & parsley. I initially only slice loaf (not all the way through) in 1 direction – spread (skim coat) butter mixture on each slice (um, yes, both sides) then put slices of cheese between bread slices. Sprinkle herbs, Parmesan, green onion slices – whatever else you’re using; then push bread back together. Slice loaf in opposite direction and continue with rest of the directions. Each finger has butter, cheese, etc. Faster and less messy! Try it!